To purchase a Wind Powered Generator from us : Send us an email with the item number and your contact information. and we do not hold inventory pre-built. and then to test the system before shipment to the customer. These may change. But, if you see it listed here then it is current on the date of publication. WE ARE A SMALL MANUFACTURING COMPANY AND FOR US THIS IS NOT AN OPTION. CREDIT CARD COMPANIES ADVERTISE THAT A CUSTOMER CAN CHANGE THEIR MIND UP TO (OR LONGER THAN) SIX (6) MONTHS AFTER THE PURCHASE AND GET AN ENTIRE REFUND. FOR SOME MANUFACTURING COMPANIES, THIS IS NOT AN OPTION. WE CANNOT CURRENTLY AFFORD TO SPEND MONEY AND RESOURCES BUILDING A PRODUCT AND THEN HAVE TO REFUND THE MONEY THAT WE RECEIVED DUE TO A CUSTOMER "CHANGING THEIR MIND". WE ARE A SMALL MANUFACTURING COMPANY. WE CANNOT AFFORD TO ACCEPT "DOWN PAYMENTS". WE CANNOT AFFORD TO ACCEPT "PARTIAL PAYMENTS." WE DO NOT ACCEPT DOWN PAYMENTS. Please remember that small manufacturing companies, which might have the absolute BEST product in the entire world, can have very limited budgets and might not be able to afford the option of credit card "change of mind" policies. We do not accept "down payments". We do not accept "partial payments". We accept CASH, CHECK, or MONEY ORDERS. The energy conversion range can vary due to the density of the air passing through the wind sweep area and other factors. If the air is dry and hot, then the density of the air could be low and thus the energy conversion could be lower than if the air is cold and wet. If it is raining then the energy conversion could be very (extremely) much higher. We do not use those silly, illogical, waste-of-space, aerofoil-lift blades. We use wide blades that are forced to turn by the IMPACT of wind onto the blades (impact vector dynamics). Thus, and let us be clear on this: READ THIS ENTIRE PAGE CAREFULLY. A non-shrouded VAWT can lose as much as 95% of its energy to structural wind loading and anti-rotational wind loading. The non-shrouded VAWT is estimated to be only 5% efficient per wind sweep area. Thus, the price that you pay for it in wind loading per actual watt hours earned can be very high. A correctly shrouded VAWT can lose as much as 90% of its energy to structural wind loading and anti-rotational wind loading. The correctly shrouded VAWT is estimated to be only 10% efficient per wind sweep area. Thus, the price that you pay for it in wind loading per actual watt hours earned can be very high. A three bladed aerofoil lifting wind turbine can lose as much as 85% of its energy to structural wind loading and anti-rotational wind loading. In addition to that, it can lose as much as 96% of its potential for wind load convertible energy by the wide open spacing between the blades. In addition to that, it can lose as much as 70% of its energy to aerodynamic non-alignment ( see aerodynamic characteristics from sandia laboratories ), which is so variable that we will ignore it for now. Being generous, the three bladed aerofoil is estimated to be only 1.2% efficient per wind sweep area. Thus, the price that you pay for it in wind loading per actual watt hours earned can be even higher than the VAWT. Our Wind Powered Generators, with our version of "flat plate technology" are estimated to be less than 40% efficient per wind sweep area. Even with ours, there is loss due to structural wind loading and some anti-rotational wind loading. When you purchase, THINK about what you are getting. Non shrouded VAWT = approximately 5% efficient. NO ! Correctly shrouded VAWT = approximately 10% efficient. NO ! 3 bladed aerofoil lifting wind turbine = approximately 1.2% efficient. NO ! Our Wind Powered Generators = approximately 39.65% efficient. YES ! We have used the "~" sign occationally. Some of our international viewers may have been confused by this symbol. It means that a number is approximate. "~" means "approximately", as in "~1" should be read as "appoximately 1". Of course these are estimates. Different manufacturers will have different percent efficiencies. Even our different models have different efficiencies. These are estimates, but it is something that you should think about. Know what you are buying. Think before you purchase. Lots of BIG WIDE BLADES ! THINK BEFORE YOU BUY ! We have stopped publishing those. We have occationally found some very similar (almost exactly the same) of these showing up on our competitors' pages. Sometimes, we are not saying who, but their product has not changed and yet their claims have changed and now they are saying that they produce (almost the same) the output that we produce. Of course the claim is slightly different, we guess to cover their butts legally, but their claims have changed so radically into line with our's that we have stopped publishing these. Do not call and ask for these. Do not email and ask for these. You will be told "no." 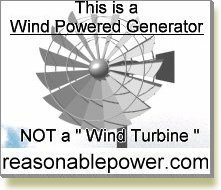 Unless you have already actually purchased a Wind Powered Generator from us, then we really do not know if we are talking to another competitor. Our answers to seemingly simple, seemingly innocent, emails and/or phone calls have often shown up on someone else's web page as a claim that they do the same. No problem. We are being more careful in giving out information. We have found a potential for a couple of types of customers; First type of potential customers are those that actually read, think, and buy. And second are those that ask for more and more and more technical information, and then they put up a web page imitating us and trying to sell those silly, illogical, waste-of-space, three bladed wind turbines. We already supply MULTITUDES of information on our web pages. If you are not sure, then read it all. Think! You do not need a chart or a graph to tell you that our Wind Powered Generators are extraordinarily more efficient per blade sweep area than those silly, illogical, waste-of-space, three bladed wind turbines. Multiply the current (amps) capacity of the incomming breaker box (commonly 100amp or 200amp or 300amp) by 240volts to get the maximum load capacity (wattage) of the system. Then divide this by 3 to get the average all-electric house needs. For a house with a combination of electric and gas, subtract 10% to 30% from that number. If they have teenagers, the energy needs could be radically higher. These are averages, remember that AFTER a homeowner's energy bills decrease (by having their own partial energy source) they might dramatically increase their energy use. Wattage and watt/hours are seriously different. They should NOT be confused as being the same. Wattage is amps x volts. Watt Hours is amps x volts x HOURS USED. They are seriously different. If the customer tells you watt hours, that is NOT watts. A tiny little one watt source, if used for 10,000 hours equals 10,000 watt-hours. A 10,000 watt source used for one hour is 10,000 watt-hours. They are very different. Do NOT let our competition fool you by their advertising "watt hours," as that is totally irrelevant (by itself) to the customer's needs. ALSO there is NO guarantee as to the watt hours that a customer will get. God Almighty controls the wind and if He decides to send no wind then there will be no watt hours available. No human can guarantee the watt hours available to the customer. ALSO there is NO guarantee as to the percent of billing reduction from using wind power. Again, God Almighty controls the wind and if He decides to send no wind then there will be no watt hours available, thus NO billing reduction due to generated electric. No human can guarantee the billing reduction available to the customer. If an advertiser states a definite future percentage billing reduction, then they are lying. If they give examples of other people's billing reductions, that is totally irrelevant to anyone else's billing. It cannot be humanly guaranteed. We shall suffer that which is common unto man. It has been common for the wind to blow and for the sun to shine. But we cannnot guarantee either. We do not guarantee these to do anything at all. These may change. But, it you see it listed here then it is current on the date of publication. Thus, and let us be clear on this, the wind velocity rating of the system is not equal to the average wind speed. An average wind speed includes both winds that are higher velocity and winds that are lower velocity. If only the average is used, then the system will not be correctly rated. As a combined estimate for all customers, we have decided that the average wind speed is between 65% and 80% of the overall wind energy available if we ignore unusual peak wind velocities. Thus, after the peak velocities have been trimmed down, we rate the wind requirements at about 1.25 to 1.538 times the "average" wind velocity. To find your wind velocity rating, use the following. That gives you the range of the rated wind velocity that is used to estimate the maximum rated output. Generally, the yearly average wind speed is 65% to 80% of the maximum estimated commonly usable wind speed. This can be very easy. Follow the steps outlined here and then chose the Wind Powered Generator model that you need. Thus the first number is "9.2 m/s"
6.0 m/s is about 65% of 9.2 m/s or 20.6 mph. Thus the second number is "7.5 m/s"
6.0 m/s is about 80% of 7.5 m/s or 16.7 mph. Or if you started with miles per hour, then it would be from 16.7 to 20.6 mph. This energy conversion range can vary due to the density of the air passing through and other factors. If the air is dry and hot, the density of the air could be low and thus the energy conversion could be low. If the air is cold and wet, then the density of the air could be high and thus the energy conversion could be high. If it is raining with lots of volume then the energy conversion could be even higher. The density of the air also has to do with elevation, or height above sea level. Use the following table. It is there for you. Look on the next table. In the left column chose the kilowatts that you need. In the right columns chose the wind speed that is closest to your required rating. (1.) Do the conversion to find the rating for your order. (2.) 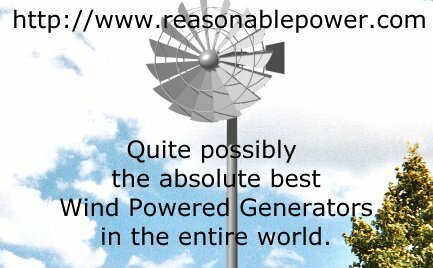 Simply order the Wind Powered Generator of your choice. We do not sell "wind turbines", those silly, illogical, waste-of-space, three-bladed things. We do not sell "wind generators". If you want a fan to generate wind, then go to a fan company. We sell "Wind Powered Generators". If you ask for a "wind turbine" or a "wind generator", then we will try to understand that you sent your email to the wrong company. If you have a sign installation company or a structural engineering company and want us to reference customers in your geographic area to you for the support (pole, foundation, and/or installation) then please tell us. As we have said many times, we do not supply the support pole. The common house in the United States of America has 200 amp service and 240 volt capacity. That is 200 X 240 = 48,000 watt service capacity into the house. If you live in the USA then that is 48,000 watts for whole house service. If you want us to assemble the Wind Powered Generator on site for you, please add the cost of our round trip transportation to the site (we are in Frederick, Maryland, USA), and also please add 5 percent to the basic list price. We can add a computer data interface to the ordered Wind Powered Generator which is either USB configured or CAT5 Ethernet Network configured, etc., from which (1) the prevailing wind speed; and (2) the Wind Powered Generator's blade rotational speed; and (3) the output voltage, and output current, and output wattage are supplied. The computer interfaceable system is $14,000 for the Wind Powered Generators which are 20KW or less, PLUS the price of the ultrasonic anometer. Higher wattage requires higher capacity igbt's ( insulated gate bipolar transistors ) which cost more and we would adjust the price for systems above 20KW. This system requires an ultrasonic anometer for measuring the wind speed which would have to be decided upon by the customer. This does NOT include a computer and an operating system. A standard laptop or personal computer is expected to be used by the customer. This DOES include installation software which is designed to work with Microsoft Windows 2000, or Windows NT, or Windows XP, or Windows Vista, or Windows 7, or Windows 8. This DOES include a NEMA classed enclosure for the computer interface connection at the pole ( the class is decided upon relative to the expected weather conditions) ( http://www.nema.org/prod/be/enclosures/upload/NEMA_Enclosure_Types_11-05-2.doc ) ( unless a wireless data transfer system is supplied ). 1,000 feet of CAT5 (or CAT5e) shielded direct burial cable. a wireless data transfer system. That is $14,000 for the software and the system, fully built in and ready to use on the Wind Powered Generator, plus the price of the chosen ultrasonic anometer. If this is ordered, then it MUST be ordered WITH the Wind Powered Generator, as it is a built in system and NOT to be added later. These apply specifically to wind powered generators, and not to any other type of item. To receive discount, full order must be prepaid. These discounts are IN ADDITION TO any other discounts and are removed from the listed sale prices of each item. For Example that means: If you use someone else's reference number and get a $500 discount for telling us who referenced you, and you also order in these volumes then the volume discount comes first, and then the additional $500 is discounted. If you purchase in volume, and get a volume discount, then the list price of the items that you purchased are considered to be listed at the volume discounted price for warranty consideration and warranty valuation. Tower foundations must be designed for your local ground stability conditions. Different soils require different tower foundations. Your Wind Powered Generator must have the proper tower and foundation to handle the wind speeds that are in your area. We do not sell towers. We do not sell tower foundations. We suggest that after you receive your Wind Powered Generator from us that you go to your local sign company and tell them that you want a tower and foundation capable of handling a sign which is the same area as the blade sweep of your Wind Powered Generator. Generally, we have found that local sign companies, when told the sweep diameter of the blades, and asked for a tower that will handle that diameter flat surface as though it were a sign, will give a solid price for the materials and labor for the tower and foundation. Locally, to Frederick, Maryland, a 25 ft tower for our 14 ft diameter model is about $7,800 including foundation and tower and material and labor. Remember our Wind Powered Generators are designed for "low wind speed startup" and may not require an extremely tall tower to work. Grid Tying your Wind Powered Generator must be coordinated with your local utility company. Different utility companies have different requirements. Different utility companies can require different grid-tie inverters (or paralleling switchboards, or grid interconnections) and this must be handled after you receive your Wind Powered Generator. We do not sell grid-tie inverters. We can suggest some companies that do. A search on Google for "Grid Tie Inverter" or "paralleling switch board" may show you suppliers local to you. Generally we have found that Grid-Tie Inverters (sometimes called Paralleling Switch Boards) cost about $9,000 for a 15KW system. We have spent many months researching this, and have found that when asking for a grid-tie inverter price it is best not to say exactly what energy source it is for since a lot of these are mostly distributed by solar cell PV companies and they have tended to get exceedingly jealous of our sales. Whaaatever. We do not manufacture grid tie inverters. We do not sell grid tie inverters. A grid tie inverter is a grid tie inverter. No matter what the solar cell people tell you. We can manufacture with AC output or DC output in either single phase or three phase. No problem for us. No change in price. If you decide to purchase a grid tie inverter from a solar cell company, and they get upitty and snotty about what the source is, simply ignore their attitude and ask them what they require: "AC or DC? ", "Single phase or three phase?". If they do not give you an answer, then mark them off your list and ask someone else for a price. Remember to look in Google for "paralleling switch board". A little insight here: look for grid tie inverters that use DC (direct current not alternating current) from the source. Shipping ! For delivery over land by TRUCK or for delivery over sea by SHIP ! for the shipping cost. Please contact the carriers on this list! They all were polite enough to tell us that they are looking for your business. You may do well to use a shipping company that cares about having you as a customer. For them to directly ask us to list their company is important. Please check the companies on this list. You chose the shipper that you use. Our pictures on this web site are renditions for conceptional purposes only. The " Wind Powered Generator " that you order will definitely not look like that. The design may be similar, but it will be different in blade size, in sweep diameter, maybe in color, etc. This is to show you that you do have a choice: Those three bladed things are not your only option. Obviously this is NOT some silly, illogical, waste-of-space, aerofoil-lift , wind turbine .